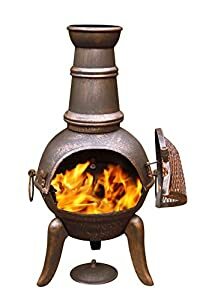 Garden incinerators & Fire Pits are delighted to offer the excellent Gardeco 90cm Granada Cast Iron Chimenea Tall Bronze Effect Finish Steel Funnel. With so many available recently, it is good to have a make you can recognise. The Gardeco 90cm Granada Cast Iron Chimenea Tall Bronze Effect Finish Steel Funnel is certainly that and will be a great acquisition. For this price, the Gardeco 90cm Granada Cast Iron Chimenea Tall Bronze Effect Finish Steel Funnel comes highly respected and is a popular choice with many people. Gardeco have added some nice touches and this results in great value. The new Granada range offers economy prices for a proven seller. Granada cast iron chimeneas have cast iron legs, bellies and lids, bellies and lids, but the funnels are made of steel.Size (dia) : 40cm. Height : 90cm. Materials: Cast iron and steel. Assembly information: suppliedMetal chimeneas will rust. How much they rust is dependant on whether they are left outside in all weathers, how much they are used, how they are looked after. All can be re-painted. Rust does not affect use. Metal chimeneas surfaces can become very hot in use and will burn the skin if touched. We recommend the use of a chimenea guard when small children are present.